During this past year, I started a new method for weight loss, or should I say a new way to become healthier in the foods I eat and hopefully in the process lose weight. A friend of mine turned me onto this method and I have been very happy with the results. It is called the Ketogenic Diet. A ketogenic diet (keto) is a very low-carb diet, which turns the body into a fat-burning machine. It has benefits for weight loss, health and performance. A ketogenic diet is similar to other strict low-carb diets, like the Atkins diet or LCHF (low carb, high fat). The main difference between strict LCHF and keto is that protein is restricted in the LCHF diet. A keto diet is designed specifically to result in “ketosis”. The ketogenic diet makes the body produce small fuel molecules called “ketones”. This is an alternative fuel for the body, used when blood sugar (glucose) is in short supply. Ketones are produced if you eat very few carbs (that are quickly broken down into blood sugar) and only moderate amounts of protein (excess protein can also be converted to blood sugar). On a ketogenic diet your entire body switches its fuel supply to run almost entirely on fat. Insulin levels become very low and fat burning increases dramatically. It becomes easy to access your fat storage to burn them off. This is obviously great if you’re trying to lose weight, but there are also other benefits, like being less hunger and a steady supply of energy! One of my favorite Keto recipes is Chicken Parmesan. I can make a batch of this and eat if everyday, it’s delicious and fills me up completely. I’d like to share this recipe with you, the recipe below is for a single serving. For the sauce, I use Rao’s tomato sauce. It’s super yummy and has natural ingredients and no added sugar. It is also low in sodium and does not contain onion or garlic, but I add them in. For this post, I tripled the ingredients to make a larger batch, I love this recipe and can eat it all week long. I used 3 skinless chicken breasts, and cut each in half to make 6 – 4 oz servings. I put them in a bag, added salt and pepper and used a mallet to flatten the breasts. Grind up flax seed meal, parmesan cheese, and spices in a food processor. In a bowl, crack the egg and whisk. In my case, I used 2 eggs. In a saucepan, combine all ingredients for the sauce and cook for at least 15 minutes while you are making the chicken. Bread chicken cutlets by dipping into egg mixture, then dipping into the coating mixture. Set aside on a plate. Heat 1 tbsp. olive or avocado oil in a pan and fry up the chicken. In my case I used 2 tbsp’s avocado oil. I cooked them 5 minutes on each side. Set pieces of chicken into a casserole dish, add sauce on top, and then add slices of mozzarella cheese. I have to tell you all, that I just purchased this large casserole (HERE). I have never owned a beautiful white, large and deep casserole dish before! I love it. The handles are amazing and it’s so elegant you can go from oven to table. I have always used the glass Pyrex 9×13 casserole dishes. I found they were never deep enough for making lasagna dishes or scalloped potatoes! (One of my favorite dishes for large get togethers, but unfortunately not Keto friendly). My glass Pyrex is only 2″ deep, that extra space makes a big difference. As you can see, there is ample room in the dish to add vegetables or anything else. I can’t wait to use this beautiful dish at my next dinner party. I cooked up some peppers and broccoli in a pan for a side dish. See you next time! Let me know what you think of the recipe. You’re welcome Ingrid. So easy to make and so yummy! Enjoy. Yum! Love this one too! I’ll send you the pizza I made last night…sooooo good!! Thanks. I’ll try it out and highlight the recipe in a future post! This looks delicious! This is definitely a recipe I will be using. 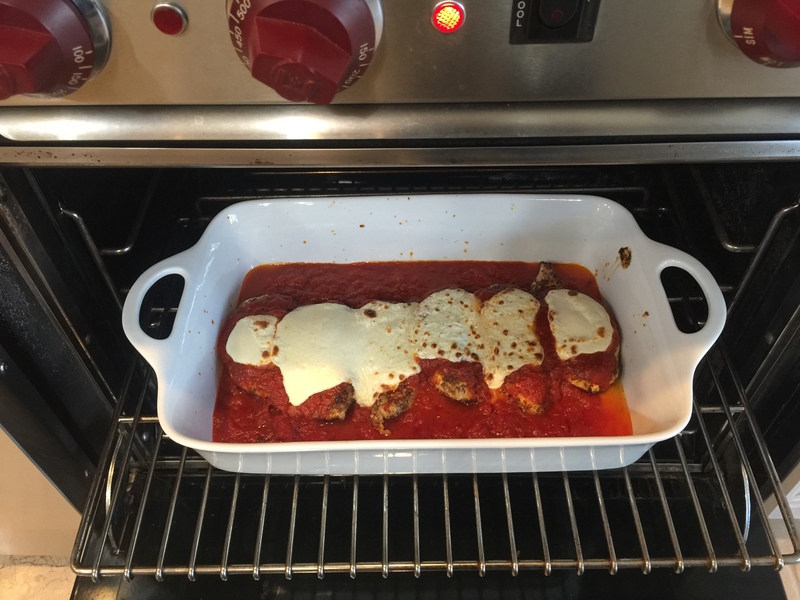 Before I started keto, I used to make chicken parm once a week. I definitely miss it. This is a great low carb alternative! Hi Tiffany, this recipe is definitely one of my favorite ones. The fresh mozzarella cheese is heavenly! Thanks for commenting.